It gives us immense pleasure to share that average returns of Saral Gyan 52 Hidden Gems stocks (Our Unexplored Multibagger Small Caps) released since inception (from Sept 2010 to Dec 2015) during last 5 years is 247.1% compared to 48.3% returns of BSE Small Cap Index. Monthly investment of Rs. 10,000 in Hidden Gems till Dec'15 during last 6 years not only allowed you to save Rs. 5.2 lakh but also appreciated your investment by almost 2.5 times making your total Hidden Gems stocks portfolio of Rs. 18.05 lakh with overall profit of Rs. 12.85 lakh. However, if you would have invested the same amount in Small Cap index, you would be sitting with overall gains of Rs. 2.51 lakh. If we look at past performance from Sept 2010 till Dec 2015, Hidden Gems SIP stocks have given annualized returns of more than 45%. Below is our Multibagger Stocks - Hidden Gems performance scorecard since inception (from Sept 2010 to Dec 2015) which illustrates value of Rs. 10,000 invested every month in Hidden Gem (Unexplored Multibagger Small Cap Stocks) stock of the month vis a vis value of Rs. 10,000 invested in BSE Small Cap Index during last 6 years as on 25th July'16. We are glad to inform you that 35 Hidden Gems stocks out of 52 during last 6 years have given more than 100% returns to our members. 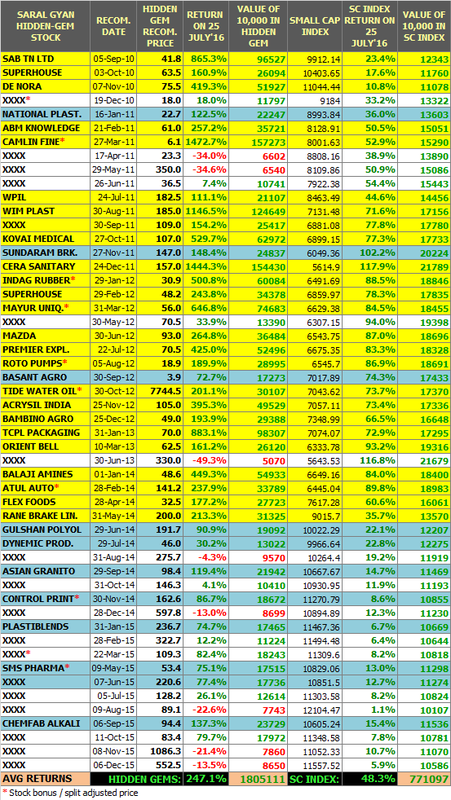 Moreover, 25 stocks out of these 35 have given returns in the range of 200% to 1900%. Note: Total 52 Hidden Gems stocks were released during last 64 months (from Sept'10 to Dec'15), we have not released Hidden Gems for the months not displayed in the table above. We also suggested our members, which earlier recommended Hidden Gems stocks can be added more in their portfolio based on company's strong fundamentals. Ex: Mayur Uniquoter, Cera Sanitaryware, Wim Plast, Camlin Fine Chemicals, Acrysil, Kovai Medical, Superhouse, De Nora were some of the stocks which we recommended to our members to accumulate later also at higher price from our initial recommended price. Now profits can be seen as these stocks have given multibagger returns. We are pleased to inform that we are celebrating this festive season by offering maximum benefit to our members. You can avail discounts up to 30% and valuable freebies on our subscription services under Saral Gyan 6th Anniversary Offer . Subscribe to our services and get rewarded by making smart investment decision in equities. Hidden Gem & Value Pick stock report of July'16 is yet not released and expected to release during 1st / 2nd weekend of next month.